Richard Heinberg. March 16, 2015. Only Less Will Do. Post Carbon Institute. Almost nobody likes to hear about the role of scale in our global environmental crisis, because if growth is our problem, then the only real solution is to shrink the economy and reduce population. Back in the 1970s, many environmentalists recommended exactly that remedy, but then came the Reagan backlash—a political juggernaut promising endless economic expansion if only we allowed markets to work freely. Many environmentalists recalibrated their message, and the “bright green” movement was born, claiming that efficiency improvements would enable humans to eat their cake (grow the economy) and have it too (protect the planet for the sake of future generations). Population has grown from 4.4 billion in 1980 to 7.1 billion in 2013. 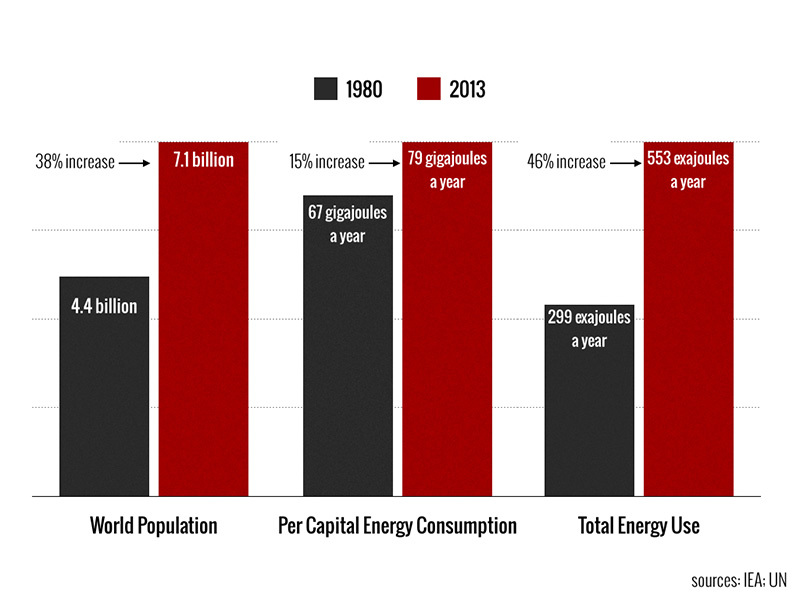 Per capita consumption of energy has grown from less than 70 gigajoules to nearly 80 GJ per year. Total energy use has expanded from 300 exajoules to 550 EJ annually. We’ve used all that energy to extract raw materials (timber, fish, minerals), to expand food production (converting forests to farmland or rangeland, using immense amounts of freshwater for irrigation, applying fertilizers and pesticides). And we see the results: the world’s oceans are dying; species are going extinct at a thousand times the natural rate; and the global climate is careening toward chaos as multiple self-reinforcing feedback processes (including polar melting and methane release) kick into gear. The environmental movement has responded to that last development by adopting a laser-like focus on reducing carbon emissions. Which is certainly understandable, since global warming constitutes the most pervasive and potentially deadly ecological threat in all of human history. But the proponents of “green growth,” who tend to dominate environmental discussions (sometimes explicitly but more often implicitly), tell us the solution is simply to switch energy sources and trade carbon credits; if we do those simple and easy things, we can continue to expand population and per-capita consumption with no worries. In the quest to make human society sustainable, the problem of scale crops up absolutely everywhere. We can make a particular activity more energy-efficient and benign (for example, we can increase the fuel economy of our cars), but the improvement tends to be overwhelmed by changes in scale (economic expansion and population growth lead to an increase in the number of cars on the road, and to the size of the average vehicle, and hence to higher total fuel consumption). Yet here we are, decades after the eclipse of old-style, conservation-centered environmentalism, and despite all sorts of recycling programs, environmental regulations, and energy efficiency improvements, the global ecosystem is approaching collapse at ever-greater speed. In reality, entirely switching our energy sources will not be easy, as I have explained in a lengthy recent essay. And while climate change is the mega-crisis of our time, carbon is not our only nemesis. If global warming threatens to undermine civilization, so do topsoil, freshwater, and mineral depletion. The math of compound growth leads to absurdities (one human for every square meter of land surface by the year 2750 at our current rate of population increase) and to tragedy. Maybe the bright greens (or should I say, pseudo-greens?) are right in saying that “less” is a message that just doesn’t sell. But offering comforting non-solutions to our collective predicament accomplishes nothing. Maybe the de-growth prescription is destined to fail at altering civilization’s overall trajectory and it is too late to avoid a serious collision with natural limits. Why, then, continue talking about those limits and advocating human self-restraint? I can think of two good reasons. The first is, limits are real. When we decline to talk about what is real simply because it’s uncomfortable to do so, we seal our own fate. I, for one, refuse to drink that particular batch of Kool-Aid. The second and more important reason: If we can’t entirely avoid the collision, let us at least learn from it—and let’s do so as quickly as possible. All traditional indigenous human societies eventually learned self-restraint if they stayed in one place long enough. They discovered through trial and error that exceeding their land’s carrying capacity resulted in dire consequences. That’s why traditional peoples appear to us moderns as intuitive ecologists: having been hammered repeatedly by resource depletion, habitat destruction, overpopulation, and resulting famines, they eventually realized that the only way to avoid getting hammered yet again was to respect nature’s limits by restraining reproduction and protecting other forms of life. We’ve forgotten that lesson, because our civilization was built by people who successfully conquered, colonized, then moved elsewhere to do the same thing yet again; and because we are enjoying a one-time gift of fossil fuels that empower us to do things no previous society ever dreamed of. We’ve come to believe in our own omnipotence, exceptionalism, and invincibility. But we’ve now run out of new places to conquer, and the best of the fossil fuels are used up. As we collide with Earth’s limits, many people’s first reflex response will be to try to find someone to blame. The result could be wars and witch-hunts. But social and international conflict will only deepen our misery. One thing that could help would be the widely disseminated knowledge that our predicament is mostly the result of increasing human numbers and increasing appetites confronting disappearing resources, and that only cooperative self-limitation will avert a fight to the bitter end. We can learn; history shows that. But in this instance we need to learn fast. This entry was posted in Birth Control, By People, Climate Change, Overpopulation, Richard Heinberg and tagged climate change, collapse, energy, environmental movement, exponential growth, mineral depletion, population, topsoil depletion, water depletion. Bookmark the permalink. Total energy use from 299 gigajoules to 553 GJ is a lot more than a 46% increase.